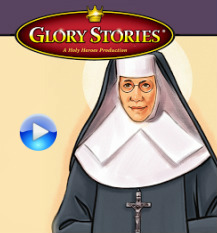 Click here to listen to the "Glory Story" (audio story on the life of a saint) about Saint Katharine Drexel! Katherine Mary Drexel was born in Philadelphia on November 26, 1858. Katharine was raised in a loving family that set a living example of selfless giving. At the age of twelve, she spent two afternoons a week helping her mother in service to the poor. The family also founded a Sunday school for neighbors and employees. When Katharine was 21, her mother was diagnosed with Cancer, and Katharine nursed her through three years of intense suffering. It was during this time that the thought of religious life came to her constantly and forcibly. She sought council from Bishop James O’Connor who advised her to pray and wait. In 1885, her father died. Katharine and her sisters were, during their lifetimes, beneficiaries of Mr. Drexel’s estate. Through the great Indian missionary, Monsignor Joseph Stephan, she became acquainted with the sufferings of the American Indians. With her two sisters, she visited the reservations to see conditions and needs. She began to build schools, supplying food, clothing, furnishings and salaries for teachers. She also found Priests to care for the spiritual needs of the people. As she became aware of the suffering of the Black people form the South and East, she extended her charity to them. Throughout her lifetime, she encouraged and financially supported missions throughout this country and abroad. In 1889, she received permission from Bishop O’Connor to become a religious. On February 12, 1891 Sr. Mary Katharine pronounced her vows as the first Sister of the Blessed Sacrament with 13 companions. The burden of administration and guidance of her congregation in the Eucharistic spirit, the total gift of self, rested on her for forty-four years. Throughout her life her interest and love for the missions deepened. Missionary work began with a boarding school for Black children and then one among the Pueblo Indians of New Mexico and St. Michael’s School on the Navajo Indian Reservation. As years passed many more were opened. Sr. Mary Katharine died on March 3 rd, 1955. The Cause for Canonization was opened by John Cardinal Krol in 1964 and came full circle with the canonization of St. Katharine Drexel by Pope John Paul II on October 1, 2000. In the opinion of her contemporaries, she was truly saintly. It was their belief that she was singled out by God’s grace. She was a source of inspiration, a model for imitation. 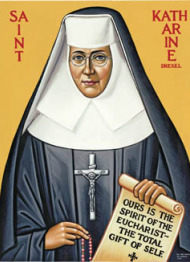 St. Katharine Drexel parish mission statement is very closely aligned with St. Katharine Drexel and her life. She was a person that ‘formed loving disciples’ and ‘gave selflessly in the realization of the Kingdom of God’. Ever loving God, You called Saint Katharine Drexel to teach the message of the Gospel and to bring the life of the Eucharist to the Black and Native American Peoples. By her prayers and example, enable us to work for justice among the poor and oppressed. Grant this through our Lord Jesus Christ, your Son, who lives and reigns with you and the Holy Spirit, for ever and ever. As Parishioners, we are encouraged to recite daily the prayer for the Sisters of the Blessed Sacrament who continue the ministry begun by St. Katharine Drexel and, whenever possible, to support the works of the Sisters. You may visit and pray at St. Katharine’s tomb at St. Katharine Drexel Shrine in Bensalem, Pennsylvania.